Created with a distinctive blend of American grown high-quality tobacco, Signal Filtered Cigars are infused perfectly together, wrapped in a high-grade tobacco leaf. Each of these discount filtered cigars are equipped with a longer filter that once ignited, allows for a slow elegant burn giving off a rich full-bodied flavor and aroma that is true to traditional smokes. Signal Filtered Cigars are manufactured in hard pack 100’s, this means you’re getting plenty of product for the price with stronger style of packaging. 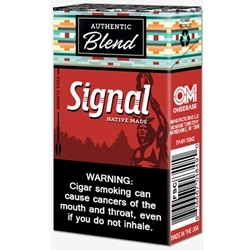 Signal Filtered Cigars are distributed nationwide by Ohserase Manufacturing, LLC Akwesasne, NY located on the Akwesasne Mohawk Indian Reservation. Each of these discount filtered cigars are available at our online tobacco store in 3 unique styles to choose from. Full Flavor, Smooth, and Menthol. Choosing filtered little cigars is a great alternative to expensive and over-priced retail brands. Here at Smokers Discounts we believe Signal Filtered Cigars is an excellent choice for your smoking needs. Our online cigar store was created to make it easy and affordable to buy filtered cigars online. Call us for more details!